How Much Will Your New Home Cost ? FINALLY! An easy to use, no-nonsense software program to help you estimate, track, organize, and build your own new home! Easily keep track of EXACTLY how much everything will cost and QUICKLY identify any areas where you can save money. you should take a look at this EXCEL program. When you are building your own new home, you will need a simple and easy way to ESTIMATE, ORGANIZE, and TRACK your expenses. My name is Mike Pompeii, and I am the author of the best selling, do-it-yourself home building book "BUILD YOUR OWN HOME!". I've teamed up with Comprotex Software, Inc., maker of the most popular home building estimating and tracking software used by professional home builders. We are pleased to offer you a scaled-down "LITE" version of their award winning software that's MADE ESPECIALLY FOR DO-IT-YOURSELF HOME BUILDERS. This cost estimating and tracking software is a specially designed EXCEL spreadsheet program. Be confident in what your new home will cost to build. Easily keep track of EXACTLY how much everything costs. No surprises! Spend less time on recordkeeping --- it's all there in ONE PLACE on your computer. Helps to quickly identify any areas where you can SAVE MONEY. Just plug in your numbers ONCE and the software does the rest! CLICK HERE to download a UB2 sample. If you do not have Microsoft Excel or another compatible application to open and use this program, you can easily download a free spreadsheet program at www.OpenOffice.org. You can now get this CONVENIENT and EASY TO USE cost estimating and tracking software through this SPECIAL OFFER. If you are thinking about building your own new home, then the UB2 cost estimating and tracking software is a MUST have. There's no reason for you to make things harder for yourself... and no reason for you to waste many hours of time and effort keeping track of your costs... you can now purchase the "UB2" Excel Program for only $24.95. But I won't stop there. I want to make things even more easier for you when you build your home. So I'm including TWO POWERFUL, FREE BONUSES. 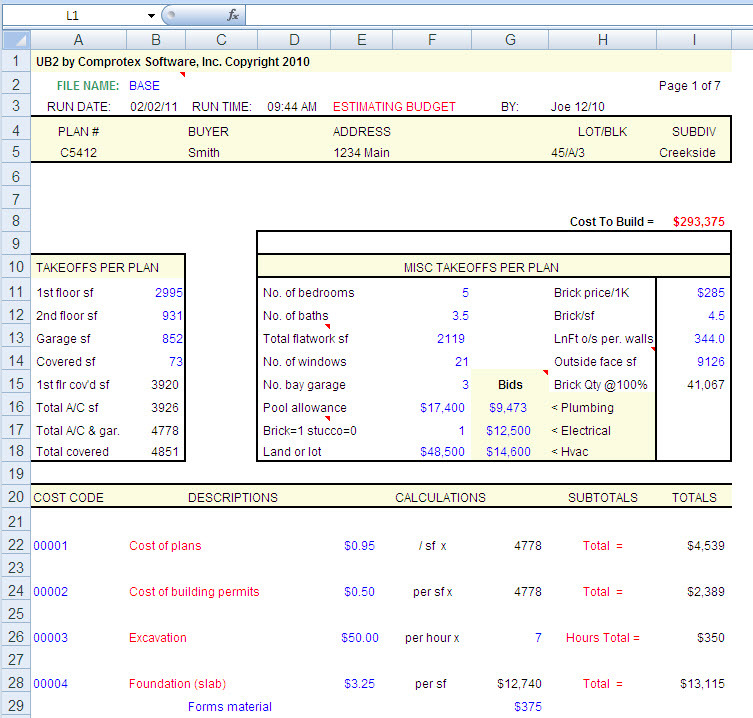 An immediate download of UB2 Cost Estimating and Tracking Software, made specifically for Do-It-Yourself Home Builders. FREE BONUS #1: Scheduler E Software for scheduling the work on your new home. 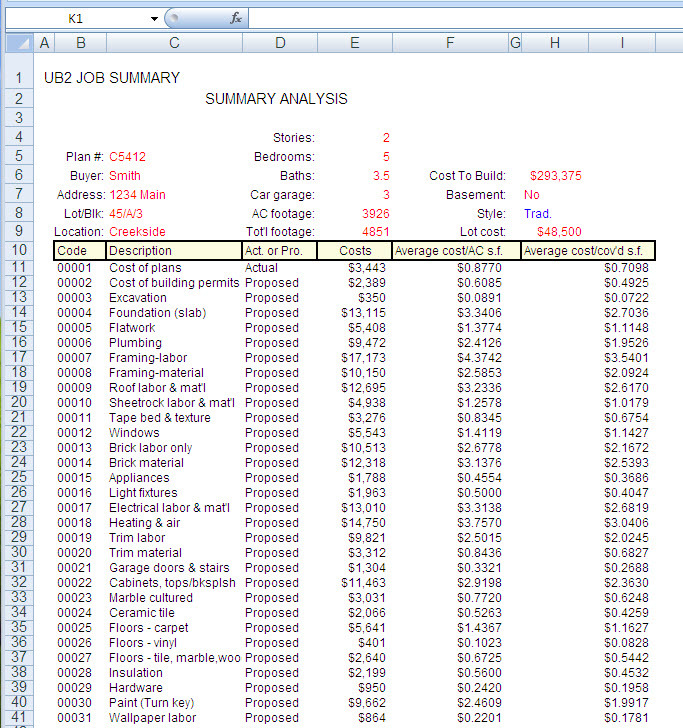 FREE BONUS #2: Bid Analysis Software for analyzing bids from subcontractors. All for only $24.95 for a limited time. Order now --- you'll be glad you did! P.S. Know what your new home will cost and be confident in your schedule. ORDER TODAY!! !